Your own art gallery might sound ambitious but with a few children, twenty minutes before dinner, a couple of hot weather days (or rainy days), you will be charging admission prices before you know it! During the school holidays, we visited the Heide Museum of Modern Art. We were all impressed by an exhibition called Freehand: Recent Australian Drawing. Then we came home to our empty pinboard, emptied of school and kinder artwork, of Christmas cards and homemade decorations. Can you guess what happened? Our drawing wall evolved day by day. Fifteen minutes here to fill in the grumpy time before dinner. Half an hour after lunch to settle us down. 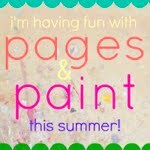 An hour on a hot day with books and paints and pens spread all over the table. Five minutes to quickly catch an idea. One evening I laid out paper and pens on the table, ready to start drawing before breakfast the next day. Sometimes I sat down with Tom and Annalise and drew with them, other times I left them to it. 4. Limit your materials - less is best! To make it look more cohesive, we stuck to brown artist pens with cream, white or brown paper. We did add watercolour paints for some experimenting towards the end. We imitated Heide and used dressmaking pins to tack our art to the wall. I pinned our pictures to the wall every day, so we could admire our growing gallery. One of the most useful books we turned to was the 'Usborne art book - Big book of things to draw'. The suggestion for doodling was wonderful. I laid out a huge piece of paper from a cheap roll, splattered paint all over it, painted a few shapes, lines and squiggles and then we spent three rainy days on and off drawing around the table. I had forgotten how relaxing it is to NOT have an agenda, to NOT do something for the sake of being productive. It's so relaxing - you just sit and draw whatever you feel like. And the splodges and splatters do invite you to be more imaginative, more inventive, more creative. We also followed the Usborne book for drawing city buildings and painting them with watercolour, and Annalise really enjoyed looking at Stephen Michael King's 'Leaf' and splashing green paint over her figures. We have a gallery wall in our home too, but not nearly as impressive as yours! I love your pinboard! What a inspiring way to spend some rainy days. My children are both under 3, but I'm saving this idea for the not too-far-off future. This is such a great idea for ur kids! This is such a neat and helpful post. I'll have to think about how we can do this type of art gallery at our house. Have fun at your playdate party tomorrow. The pinboard looks fantastic. Such an inspiring post, thanks Karen. What a fabulous idea! How big is your pinboard? I love it.